They are former biologists, engineers, therapists. They grew up under the influence of Richard Nixon and “Reefer Madness.” Some of them experimented with pot in their 20s. Others came upon cannabis much later, in their 50s. Today they have two things in common: They all live in a gated senior community called Rossmoor. And they all consume cannabis. Rossmoor, just a few miles outside of Oakland – the capital of California’s legal marijuana market – is situated on 1,800 sprawling acres with meticulously landscaped grounds, pristine gardens, wandering creeks and flowing fountains. Named by U.S. News and World Report as “one of America’s best healthy places to retire,” it has all the trappings of a luxury retirement villa: two golf courses, three swimming pools and over 200 clubs, from ceramics, sewing and lapidary, to bridge, tap dance and cocktail affairs. And five years ago, the Rossmoor 420 Club was added to that list. What started as a social get-together of about 20 pot-friendly residents has evolved to become the Rossmoor Medical Marijuana Education and Support Club, with upwards of 100 people in regular attendance. Once a month, the group convenes, often at standing-room capacity. A guest speaker is invited, sometimes bringing product samples, and together the community learns and shares information on the myths, history and medical applications of the plant. Lee knows first-hand the curative powers of cannabis. A few years ago she went to the doctor for foot pain and discovered she had a brain tumor. After brain surgery, she suffered from extreme pain and balance issues. Doctors prescribed her a potent cocktail of muscle relaxers, sleeping pills, antidepressants and high doses of painkillers. When she would try to leave her bed, she would collapse. She could no longer drive because the medications were so overwhelming. Thanks to a steady regimen of cannabis oils and tinctures, Lee was soon able to ween herself off prescription medications, and has been on something of a crusade to educate herself and others since. By placing the emphasis on education and support, Lee hopes seniors can arm themselves with the knowledge to make healthy decisions for themselves. But the club doesn’t stop there, it also helps seniors get access to cannabis medicine. “We steer people away from edibles,” Lee said. Seniors are encouraged instead to use sublingual tinctures and oils, in part because it’s easier to manage dosage. To limit any psychoactive effects and because it helps them sleep, the seniors start out with a nighttime dose before bed. While at first the combination of retired seniors and cannabis may seem an odd pairing, it’s becoming something of a trend. “There is anecdotal evidence that people with health conditions which medical marijuana could help treat are relocating to states with legalized marijuana,” Michael Stoll, a professor of public policy at University of California, Los Angeles told Money Magazine. According to data from United Van Lines, one-third of the people who relocated to the Mountain West region (which includes Colorado) in 2014 moved specifically for retirement. And in Colorado, “Many dispensaries have seen the largest portion of sales going to baby boomers and people of retirement age,” Taylor West, deputy director of the National Cannabis Industry Association, told Money Magazine. While Rossmoor is unique, the county it resides in might well be considered antique, espousing attitudes not ideologically far off from the Reefer Madness rhetoric senior citizens grew up being taught. Contra Costa County bans dispensaries and personal cultivation, and was mulling a ban on deliveries, as well. But Rossmoor’s cannabis enclave isn’t letting county rules get in its way. Most of these seniors have spent their entire lives following the rules. Now that they’re retired, they’re doing as they please. At the monthly meeting leading up to April 20, guest speakers arrived with a variety of topicals and creams formulated with a minute quantity of cannabis, and spoke to the crowd about microdosing. The meeting opened with an announcement that one of the club’s long-time members, Doug Stiles, would soon be leaving Rossmoor. 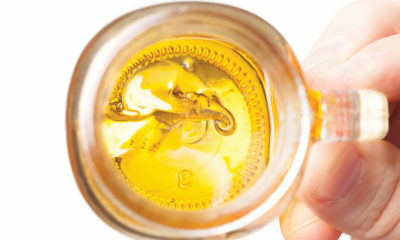 Stiles is perhaps one of the most recognized members – mostly because a photo of himself medicating with cannabis tincture landed in a San Francisco newspaper. His youthful energy belies the fact that he’s approaching 80 years old. He uses infused olive oil at a 1:1 ratio of THC to CBD to reduce stress and help him sleep. “Living here has made me extremely happy,” Stiles said before the crowd. But since his wife needs extended care, they’re relocating closer to their family, and will reside in Rossmoor’s more famous sister community: Orange County’s Laguna Woods. “They have their own dispensary,” he said, as the crowd responded with oohs and ahhs. While most members spoke favorably about the impact cannabis has had on treating their conditions, one senior who spoke on condition of anonymity confessed he has a “problem with cannabis” – but not the kind you’d expect. Throughout the meeting countless stories could be overheard about how cannabis has helped cure the aches and pains of aging. The plant has so successfully treated Lee’s ailments that in 2012 she was able to quit cannabis, and now consumes it only occasionally. TELL US, are you a senior who is interested in cannabis? My name is Doug Stiles and I’m now living in Laguna Woods Village having moved due to my Wife’s need for my Care Giving as her illness continued. After our move in June of 2016 my Wife passed away in December of 2016 and I have continued living in the Village. I was, as described in the article, using a sublingual tincture for stress and sleep while caring for my Wife. After She passed I found, after several months, that I no longer was stressed and had no problems sleeping so I discontinued use of the tincture. I still use, for my sun damaged skin and the Basil Cell Carcinoma that affects me, Medical Cannabis-infused organic coconut topical daily on my face and body where needed. I have not been active in our Medical Cannabis Club here in the Village but truly believe in the benefits of Cannabis for us Seniors and continue to educate those Neighbors and Friends that could benefit from this medicine. Rossmoor has been and will continue to be the ideal retirement location with a truly fine Medical Marijuana Education and Support Club.